European Parliament pays respects to Hadar Goldin, one of two fallen IDF soldiers whose remains are being held by Hamas in Gaza. The European Union Parliament honored a falled IDF soldier this week, at an event marking the opening of a special exhibition in his memory in Strasbourg, France. IDF soldier Hadar Goldin was killed in August 2014 during Operation Protective Edge against the Hamas terror organization in Gaza. Since his death, Goldin’s remains have been held in captivity by Hamas in Gaza, along with the remains of Oron Shaul, another soldier killed during Operation Protective Edge. The ceremony honoring Goldin and marking the opening of the exhibition took place just hours before the city of Strasbourg was hit by a terror attack, and just before Hamas took responsibility for the death of the baby killed in the Ofra attack. 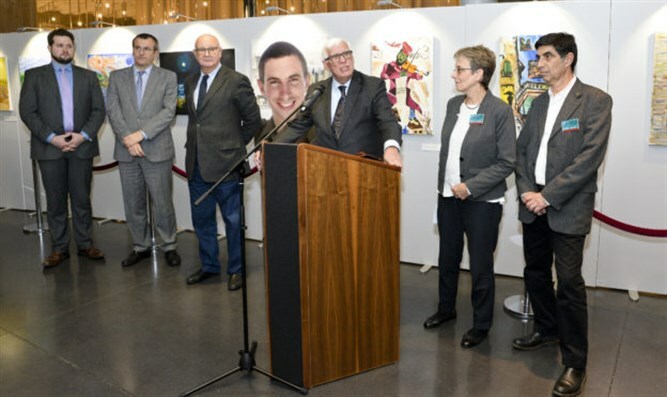 “How horrendous and worrying that terror has claimed lives again, and how tragic and moving that the parents of Hadar Goldin live through the pain every day as the remains of their son are still being held captive in the hands of those who killed him”, said Member of European Parliament Bastiaan Belder, who co-hosted the exhibition. The European Parliament’s Vice-President for Human Rights, Pavel Telička, who granted his patronage to the exhibition at the European Parliament, stressed the need for the international community to step up efforts to bring to a close the humanitarian case after years of waiting for the family. Hadar’s parents, Leah and Simha Goldin, who travelled to Strasbourg for the opening ceremony, expressed appreciation for the strong support and continuous effort of the European Parliament for the case of their son and upholding universal humanitarian values. “Hadar’s parents have fought tirelessly for something they should never have to: the right to bring Hadar home. Our moral duty is to stand with them”, added Nuno Wahnon Martins, Director of EU Affairs, at the inauguration ceremony on behalf of the European Jewish Congress as collaborating partner. The 23-year old Israeli Lieutenant Hadar Goldin was killed by Hamas two hours into a humanitarian ceasefire in 2014 and the terrorist organisation has ever since refused to return his remains for proper burial. The European Parliament has taken a strong stance in both a resolution (April) and hearing (June) this year, calling for the remains of Hadar Goldin and Oron Shaul, and the two missing citizens, to be returned immediately and for the international community to live up to its responsibility and duty as trustee of international humanitarian law. The exhibition, featuring some 20 fine art pieces by Hadar Goldin, was held under the patronage of EP Vice-President for Human Rights MEP Pavel Telička, and co-hosted by MEP Bastiaan Belder, Vice-President MEP Ioan Paşcu, MEP Cristian Preda and MEP Anders Vistisen, in collaboration with the European Jewish Congress. The exhibition will travel onward across Europe, expressing a hope to bring Hadar home for final rest.